Buying and selling items for transmogrification purposes have been a mainstay of many gold makers for a long time. The market had it’s heyday when the feature was added to the game. 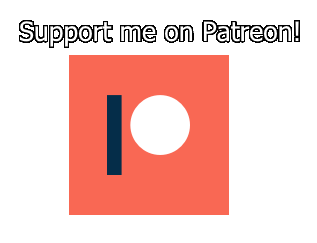 It is still a good source of profit, and it should not be underestimated by anyone. I will be writing up a short two part series on transmog. This is part 1 where I will focus on crafted gear. In part 2 I will cover items that are drops and that you will buy and sell directly on the Auction House. I have had some decent results from this. I crafted up a ton of transmog using the method outlined here before Legion launched. I have not restocked since then, but my sales amount to about 1k gold per day on average which is decent enough. It would be a lot higher if i continuously restocked. 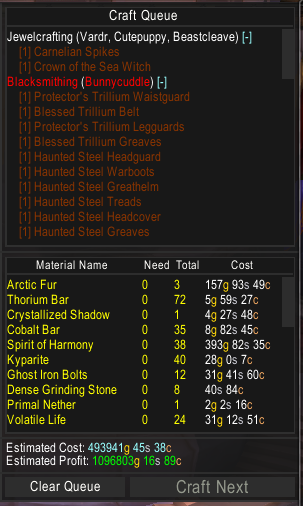 Crafted transmog can have very high profit margins. This is usually counteracted by very slow sales. This means that you need to have a large stock of different items to see any meaningful short term return. Profit margins can be as high as 30 000 gold on an 8 000 crafting cost item, so it can definetly be worth it. There is a huge variance in the attractivity of various items and some will not sell at all. Some recipes are extremely valuable. There is also a very large amount of items that can be transmogged (literally all crafted armor and weapons). You obviously only want to craft the ones that will sell. In addition Transmog requires quite a lot of inventory space as each item is one slot and you need a lot of them. You might want to use a separate character to handle this inventory. Most people only repost once every 2 days and use 48 hour posting period. I do this as well. If you are running 300+ items you definetly want to do this on a separate banking character to reduce mail collection and reposting time. Luckily there are easy ways to get started in this market. 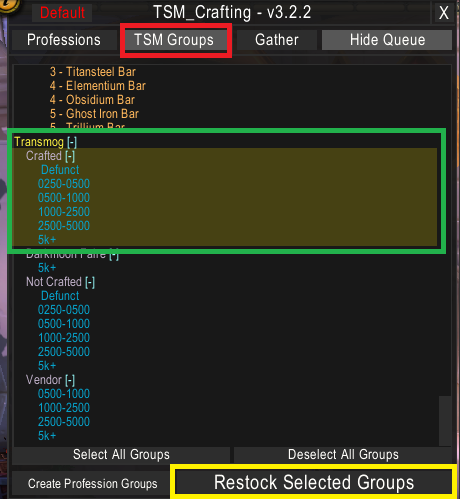 There are several comprehensive TSM groups available for transmog items. I prefer Phat Lewts groups, but you can also try out Sheyrahs. I will include my operations for crafted transmog based on Phat Lewts group at the end of this post. The reason I preferred Phat Lewts was the clear split between crafted and other sources and a structure with the right amount of detail (in my opinion). 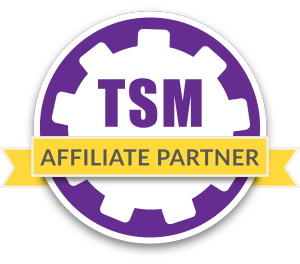 I do not suggest going into this market if you are not using TSM. It would require an inordinate amount of time learning prices, posting auctions and picking what to craft. My approach is fairly simple and relies on applying a simple crafting operation to the entire transmog group. Restocking this group will queue all the transmog items I can craft and that are profitable, without having to check which are in demand. 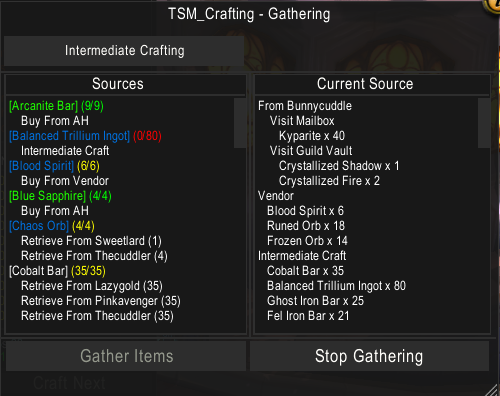 By importing a transmog group you ensure that all the items you craft have some degree of desirability and by using TSM crafting you automate the process of picking what to craft. Pretty elegant if you ask me. My TSM operation stocks only one of each item. Due to the slow nature of sales I do not want to commit too much capital in this market. 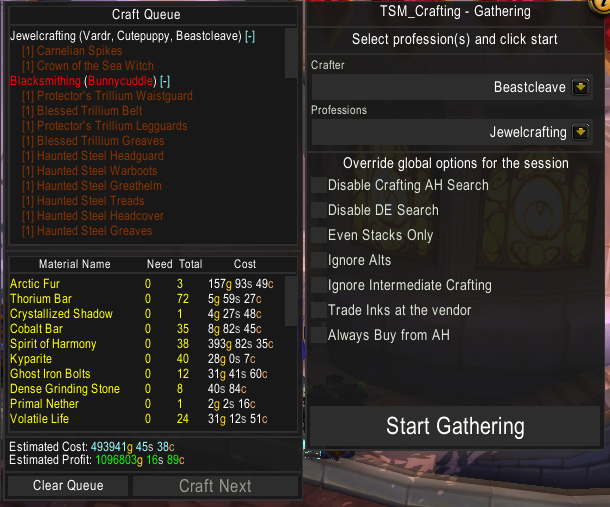 To restock groups with TSM crafting you want to open your profession window and click TSM Groups at the top, then select the desired groups and click restock groups. This will fill your crafting queue as in the above picture. The picture below shows where you want to click to get the crafting queue filled. To craft all of the queued items you will likely need to buy a ton of materials that you do not have available and that you likely do not usually buy. Luckily TSM has you covered here as well. The gathering function will simplify what you need to do tremendously. The button for gathering can be found at the top of the profession window as seen above. It will open the window below. Here you can pick which profession you want to gather materials for and which settings you want to use. The most important settings are probably the two last ones and Ignore alts. You might want to do this to more easily get all the items you need on the same character. Once you click start gathering the Gather window will open. You want to have this window open and head to the Auction House, mailbox or the relevant vendor as necessary. Then click start gathering and it will start searching for the items you need. The AH search will automatically search for the next item on the list as soon as you have enough of one material. This is pretty genius. Gathering can also tell you on what alts you have materials you might need as you can see from my window here. The gather window will persist across characters. It will stay open when you relog, which is VERY useful. You can see how it looks when the AH UI is open below. As you can see the Gather Items button has gone active and if you click it the scan will begin. In general the Gather Items button will change according to context and manage shopping, mailing etc. Once you have the materials you just need to craft through the queue. The crafting queue will be full, so you just need to click craft next until it’s done. Then you mail them to your banking alt. Post all my stock for 48 hours at a time and I let them stay on the AH till they expire. Cancelling and reposting will take too much time as the required mailbox refreshes would be crazy. My minimum price is based on crafting cost or DBhistorical. It’s set to 150% crafting as the slow sales mean I want to get a decent profit margin. You can find my TSM settings for my Crafted transmog group on my pastebin. It is based on Phat Lewts groups and contains all the most relevant crafted transmog gear. That’s it! Hopefully this write-up will enable you to dip your to into crafted transmog. This is the most profitable part of the market in my experience, so I strongly suggest trying your hand at this! Do let me know if anything is unclear and we will get to it! Thanks for the post, very compelling!